A tip so small it made headlines around the country may end up producing a huge payout. Last week Philadelphia Eagles running back LeSean McCoy left just a 20 cent gratuity, and now the signed receipt for that lousy tip is up for sale on eBay. And as of this writing, that little crumbled piece of paper is going for $100,000. We did not make a mistake with those zeros. We’re talking a tenth of a million dollars. To recap: It started September 8, when someone at Philadelphia’s PYT restaurant (home of insane burgers) decided to “tip shame” McCoy by posting a photo of his receipt to the burger joint’s Facebook page. The image of a 20 cent tip on a $60-plus check quickly went viral. But though many felt a millionaire tipping pocket change was unfair, other reactions were mixed. Sources who spoke with McCoy claimed the NFL player had issues with his service, leading some to feel the tip was possibly justified. Philly.com columnist John Featherman even confirmed that Up had knowledge of the eBay sale, writing, “When I asked Up specifically about who the eBay seller was, he told me ‘His name is Jake. He DJs at PYT.’” If you can’t trust Jake the DJ to handle this matter, who can you trust? So here we are: a society bidding on viral receipts on eBay. 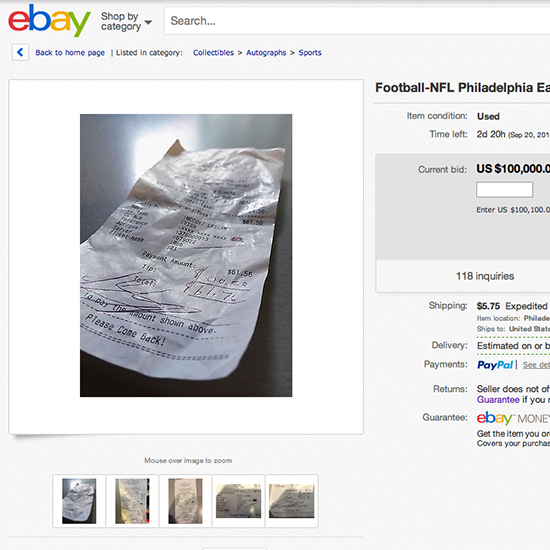 Is a signed receipt really worth $100,000? You can get an autographed LeSean McCoy jersey for on eBay for $139! Viral does not equal more value. It might have seemed fun in 2012, but does anyone want the cowboy hat that dude wore in the Gangnam Style video in 2014? No, they do not. If we’re lucky, this current $100,000 eBay bidder will be none other than LeSean McCoy himself, and the whole incident will tie up nicely as a big publicity stunt. The timing would make sense: Earlier this month, PYT had announced a plan for franchising. Although it would have to be quite a conspiracy by some very wealthy people as six bidders offered at least $99,000 for the receipt in the past two days. If we’re unlucky, someone out there really will pay at least $100,000 for a restaurant receipt, and society as we know it will have finally crumbled. See what happens when you don’t tip enough!